Continuing on today with a look 1 Corinthians 12 and the question of Spiritual gifts. Are they for today? So far we’ve seen nothing in 1 Corinthians 12 that would tell us otherwise. 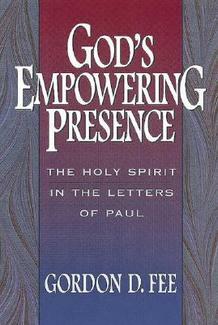 But Paul has definately put a lot more effort into explaining what the gifts are and how they are to be used. I’ll continue with verses 12-31.
Who knew that my post “The Pentecostals are not wrong” would case such a stir? There are some strong opinions out there on the subject, and I guess when someone feels strongly one way or the other they feel compelled to defend their view. I understand that fervour as I’m prone to do the same. Today I thought I would start a series looking at Spiritual gifts and more broadly the work of the Spirit. My wife and I planned a week off work together. Her academic calendar said she had a “study” week, and my work offered me an extra week of annual leave with no strings attached. Call it divine timing because the break has been so refreshing. I didn’t get as much reading done as I had hoped, but I did get a few things done. Continuing on my blogthru series of the New Testament I’ve come to the book of John.Its definitely one of my favourites because its so different from the the synoptics. John has a different emphasis to the other evangelists. His Christology is explicit all the way through. He does not wish to leave his audience with any doubts as to Jesus’ identity. I want to pick up on a few themes my reading of John. Its been a slow week for blogging. I’m not sure what to write about. There are too many things in my head right I’m not sure I’d be able to put them down into a coherent post. Perhaps recounting where I am at will help. Im studying the New Testament at the moment, going through each book. I’m looking for theological emphases, and distinctions. If I could put it down to a word, I’m soaking myself in the text, and keeping an open mind to see where the Spirit leads. I’ve read the New Testament through many times, late last year I read it in 2 weeks, but nothing beats going through it with a fine tooth comb. I’ll share some brief insights I’ve learned from the Gospels so far. I still vividly remember a sermon my pastor preached a while back. Actaully when I say vividly I mean one particular thing he said during his sermon. He said that your theology of the cross will always reveals your theology about sin and salvation. Ask someone what they think the cross accomplished and you’ve got a basic shorthand for what they believe about a number of other things.